While hand textured ceilings can bring beauty to a room or your Wesley Chapel home, old and outdated popcorn texture ceilings can be equally as displeasing. but we can also repair existing popcorn ceilings if you have a limited budget. With popcorn ceiling removal or replace your unwanted textured ceilings, Arrrow Ceiling can creating a smooth, fresh design, or a different ceiling texture style altogether. We specialize in various texture ceiling designs. Texture Ceilings can add unique and creative looks to a room, as well as making it appear distinctively different from the vast majority of common ceilings. Aside from being aesthetically pleasing, textured ceilings also provide a certain level of acoustic sound dampening between rooms. We have many different styles and options, so whatever your home’s vision, Arrow Ceiling of Wesley Chapel can help you achieve it. Are you looking for a qualified Wesley Chapel Texture Ceiling Company to install, replace, or remove thru our popcorn ceiling removal process in your home? Please contact the experts at Arrow Ceiling to learn more about our textured ceiling options, and to set up a free in-home estimate. 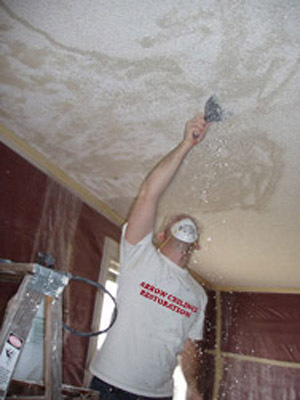 If you're looking for a Wesley Chapel Ceiling Contractor Specializing in Popcorn Ceiling Removal, Popcorn Ceiling Repair, Drywall Repair, and Texture Ceilings and Walls, contact Arrow Ceiling Restoration today at (813) 840-3717, or complete our estimate request form.